A bad gopher infestation can reach populations as high as 30-40 per acre. A typical gopher mound is crescent shaped with a round plug on one side of the mound; they can be distinguished from mole mounds which are fully circular and the plug is in the center. In orchards, the risk is to the roots and especially crown of the tree. Feeding on the bark around the crown girdles the tree, leading to tree collapse or death. Trees are at greatest risk for damage when their preferred food sources of weeds or cover crops dry up and they require another food source. Gophers also gnaw on subsurface drip and plastic irrigation lines which leads to decreased distribution uniformity and irrigation problems. 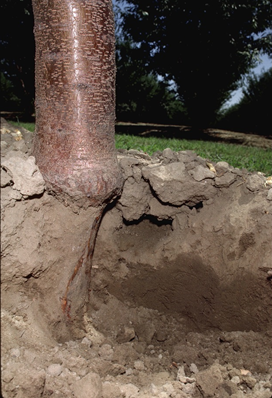 If you have trees declining and you suspect gopher damage, dig carefully away around the crown of the tree. Look for gnawing and tooth marks, accompanied by missing bark – a severely affected tree can be girdled the entire way around the trunk. The pattern of affected trees may vary. I have seen some orchards where gophers moved down the row, feeding on one tree after the next; in other orchards, the affected trees are more randomly distributed. Bark removed from the crown of an almond tree as a result of gopher feeding. The gopher tunnel can be seen just to the right of the trunk. If your orchard had a fair amount of standing water from rain over the last couple months, gophers may have experienced greater winter mortality than usual through drowning or predation while in search of higher ground or berms. Note, however, that the abundance of resident vegetation growing in response to the rains may offset winter mortality with a reproductive pulse and population bounce. Now is a fantastic time to control gophers while populations are lower, and before the reproductive pulse occurs in the March-May time frame. If rain continues throughout the month, the best time to look for fresh mounding activity for implementing control measures is approximately 48-72 hours after rainfall. I’ll briefly run though some methods that don’t work and that you would do well to avoid, and then focus on some of the strategies that have better efficacy. Exclusion fencing around the perimeter of the orchard. A logistical nightmare, it’s also expensive and provides minimal benefits over so large an area. Gas cartridges and smoke bombs. These methods don’t work because of the complexity of the burrow system, gasses leaking out through porous soils, and the gopher behavior itself – they will physically plug off the burrow when they detect something is amiss. Exceptions: Aluminum phosphide tablets and carbon monoxide generators (more on these below). Sounds, vibrations, and electromagnetic devices. These techniques may be slightly efficacious in the short term, but gophers burrow next to active train tracks. Clearly, the noise and vibrations are not a deterrent in the long run. Reliance on predators (owls, herons, snakes etc.). Predators can control populations if you have appropriate predator habitat available, as well as a relatively high tolerance to gopher populations. Research into use of barn owls is ongoing. Flood irrigation. If you are relying on flood irrigation, a subset of gophers may drown or decide to move out of the orchard. Trapping is labor intensive, though the labor costs may be offset by the high efficacy (greater than 90% after a couple sessions). 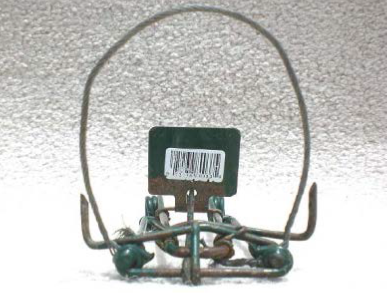 Commonly used traps include the Macabee, Cinch, and Gophinator (pincer-type traps). Of traps tested by Baldwin et. al. in 2013, the Gophinator was the most effective, in part because it trapped larger individuals best. For the handy grower with a stash of Macabee traps hanging around, the trap can be modified by adding a 9” cable (0.06” diameter) to the front of the trap (see below), which increases catch rate of larger individuals. A newer trap to the market is the Gopherhawk. It is much more expensive, but anecdotal evidence from growers is positive; however, it has not been tested along-side other trap types in independent UC research trials. To use pincer-type traps (e.g. Gophinator), find a fresh mound and use a probe to find a main tunnel running parallel to the ground surface. Tunnels are generally about 6-8” below the surface. When you find a tunnel, resistance to the probe will decrease and the probe will drop quickly a couple inches. Dig carefully down to the main tunnel and place two traps, one facing in each direction. You can cover the hole, though it doesn’t increase trapping efficacy except at hot temperatures and it substantially increases the amount of labor time involved. Human scent doesn’t appear to have an impact, so gloves are not necessary, and attractants such as peanut butter only seem to help if your trap set is covered. Traps can also be placed in the lateral tunnels that run up to the fresh mounds; while they are easier to set, they are also not as effective. 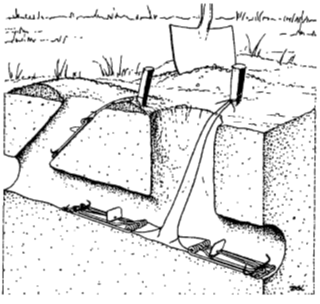 Diagram of gopher tunnels showing placement of gopher traps. Two traps set in opposite directions in the main tunnel is better trap set. The lateral tunnel trap (on left) is easier to set up but has less productive trap capture. From: Marsh, 1998, Proceedings of the Eighteenth Vertebrate Pest Conference. Aluminum phosphide and carbon monoxide generating machines are two fumigant options for gopher control. Aluminum phosphide is a restricted use material and a permit is required for application. After probing near active mounds to find a tunnel (see above), the tablets or pellets are dropped into the tunnel and the tunnel sealed with a rock or soil. The key for efficacious aluminum phosphide use is appropriate soil moisture. At tunnel depth (6-8”), the soil should be moist enough to maintain a ball in your hand. If the ball falls apart, the soil is too dry and the treatment will not be effective. Carbon monoxide machines are the least effective and most expensive of all the methods I’m describing in this article (approximately 60% effective), but may have a role if growers have large acreage to treat or if baits and aluminum phosphide become further restricted. Currently, the most effective option is the PERC machine, which forces pressurized carbon monoxide into the burrow system and asphyxiates the gophers. There are two types of baits available for gopher control. Acute toxicants (such as strychnine and zinc phosphide) kill after a single feeding; anticoagulants (such as chlorophacinone or diphacinone) require multiple feedings over 3-5 days before having a lethal effect. Widely recognized as the most effective, strychnine is now typically available only as a 0.5% formulation, and is difficult if not impossible to obtain. If you do have access to strychnine bait, recognize that gophers can develop behavioral avoidance to the bait over time, so other methods may need to be employed as well. Zinc phosphide is more readily available, but gophers will frequently avoid it because of its distinct smell and taste. Anticoagulants require a larger amount of bait (10 times the amount of strychnine bait) to be placed because gophers must feed multiple times; this increases the costs of treatment. Baits are applied in the main tunnels, and several baiting tools/methods are available. 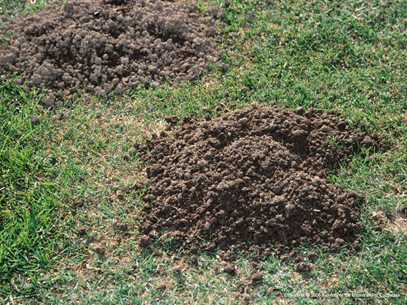 The basic protocol is to find active (fresh) gopher mounds, probe to locate the main tunnel between two mounds (as described above), drop the bait into the tunnel, then cover the probe hole with a rock or soil. Plan on baiting the burrows again if new mounding activity is detected 2 or more days after strychnine/zinc phosphide baits or 7 to 10 days after anticoagulant baits. If hiring applicators, ensure that they are trained to distinguish active tunnels versus back-filled tunnels. Individuals who have been trained are twice as effective as those who haven’t received training. Secondary poisoning to predators is a major issue with baits, particularly anticoagulants. You recommend healthy predator communities but then fail to warn about poisons secondary effects. Do NOT put owl boxes in orchards treated with bait!! The baits registered for use in agricultural systems include: zinc phosphide, strychnine, and the anti-coagulants chlorophacinone and diphacinone. Strychnine, applied to label instructions, should only be used underground and because the death is quick, tends to leave the rodent underground still in the burrow. Strychnine is only registered for gophers and this is because they live exclusively underground. There is potential for secondary toxicity, but it is not known to happen often. Zinc phosphide is toxic to secondary predators only while the bait is still in the rodent’s stomach, but not after the rodent has digested the bait. Thus this bait is considered lower-risk to secondary predators because the predator would only be affected if it consumed the rodent immediately following the rodent’s consumption of the bait. While theoretically possible, there are no known deaths from secondary toxicity to predators due to zinc phosphide baits. Anti-coagulants get a bit more complicated. There are two classifications of anti-coagulants, the so-called first generation and second generation. Second generation anti-coagulants are documented to have serious secondary effects on predators such as owls, coyotes & bobcats. In 2014, California made second-generation anti-coagulants restricted use materials. They can be applied only by licensed personnel with appropriate notice and are not registered for orchard settings at all anymore in California. Additionally, they are registered only for roof rats, Norway rats, and house mice, not gophers. Chlorophacinone and diphacinone are both first generation anti-coagulants. First generation anti-coagulants have a short half-life (hours to days) so the bio-accumulation of the chemical is considered low, especially in non-target predators. That being said, toxicity does occur from time to time. All of the above, of course, is predicated that the baits are being used according to labeled instructions: placed either in bait stations or underground and at the appropriate rates. All these materials require a license for application, and knowledge of risks versus benefits of all these materials is important for growers to understand. If you find a dead predator and suspect poisoning or toxicity due to baits, you can contact Stella McMillin at California Department of Fish and Wildlife to have it analyzed. Please emphasize strongly that you should not encourage predators if you’re going to use poison baits. You WILL kill your predators through secondary poisoning. Better still, just don’t use poison, because you’re going to end up killing predators even if you’re not encouraging them to be there.